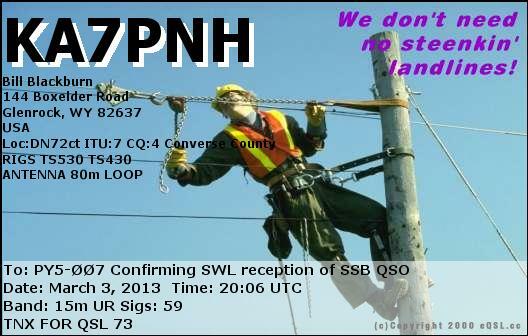 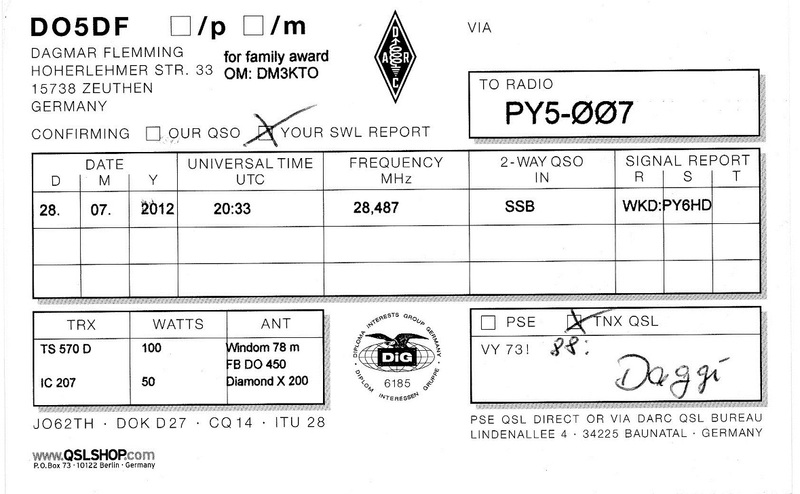 eQSL recebido: WA0MHJ, Ham Lake, MN, United States, 7 MHz, QSO w/ PT2CM (ARRL DX SSB Contest). eQSL recebido: YY4DNN, Valencia, Venezuela, 21 MHz, QSO w/ YB0MWM, PY2FN, VK3FM, etc. 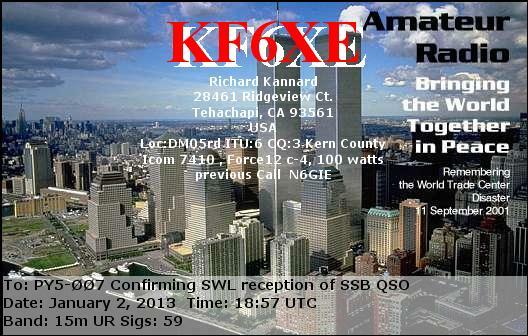 eQSL recebido: KF6XE, Tehachapi, CA, United States, 21 MHz, QSO w/ YY4KWB. 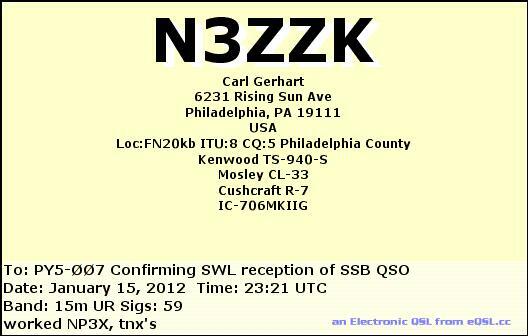 eQSL recebido: K8ZZU, Clarkston, MI, United States, 21 MHz, QSO w/ LR5H (IARU HF World Championships). 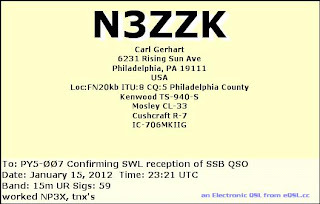 eQSL recebido: N3ZZK, Philadelphia, PA, United States, 21 MHz, QSO w/ NP3X. 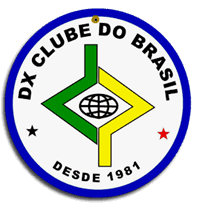 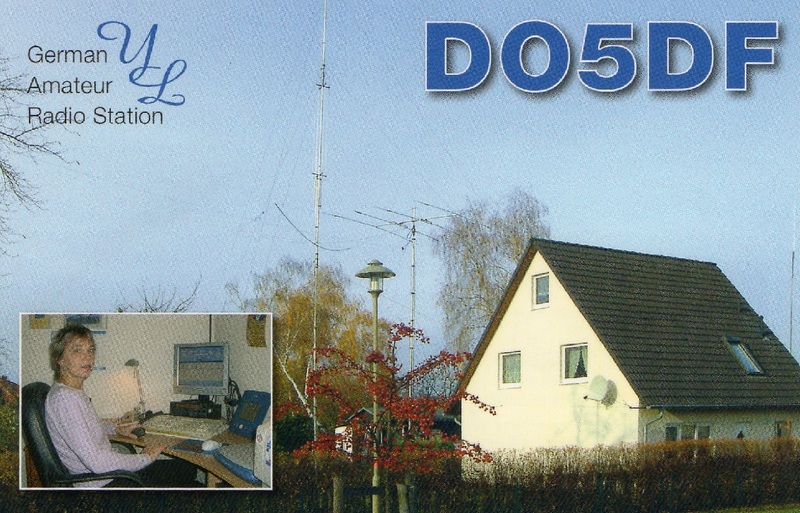 Cartão QSL recebido: DO5DF, Zeuthen, Germany, 28 MHz, QSAO w/ PY6HD. 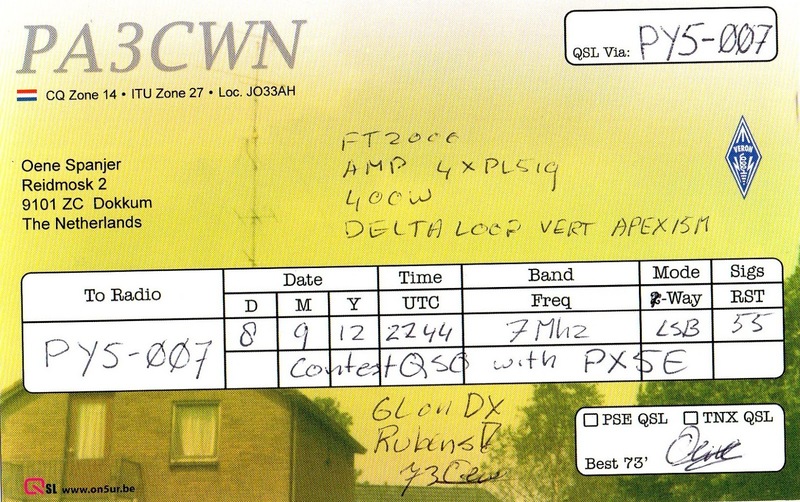 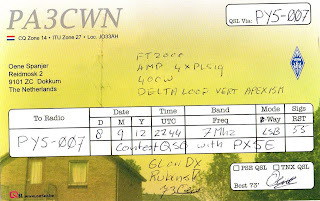 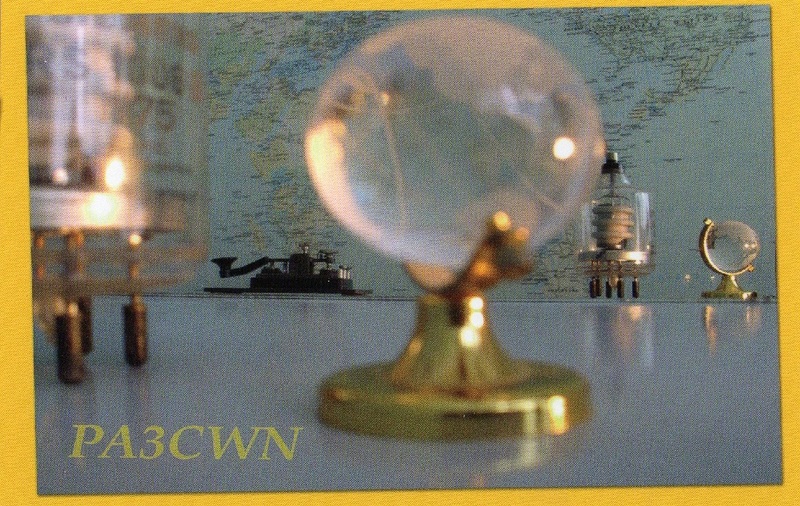 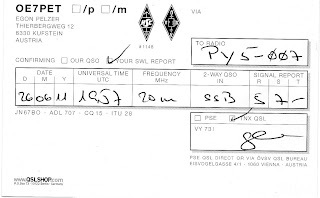 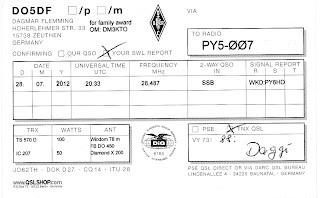 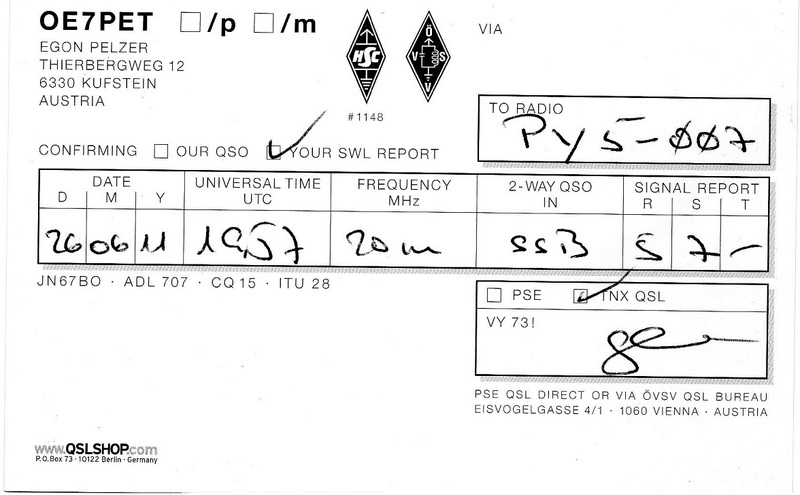 Cartão QSL recebido: PA3CWN, Dokkum, The Netherlands, 7 MHz, QSO w/ PX5E. 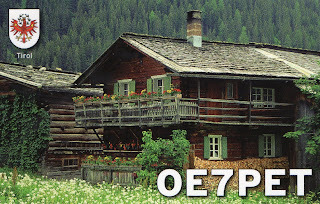 Cartão QSL recebido: OE7PET, Kufstein, Austria, 14 MHz, QSO w/ PY6RT. 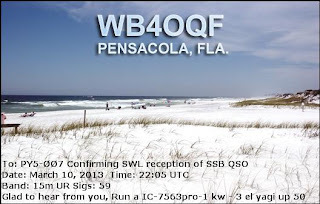 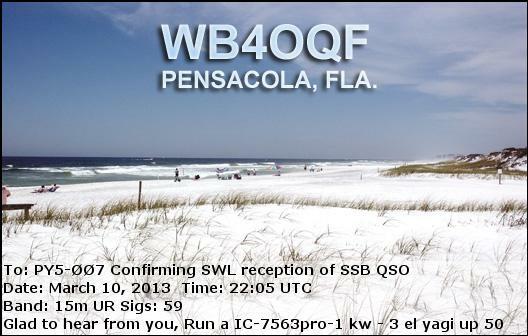 eQSL recebido: WB4OQF, Pensacola, FL, United States, 21 MHz, QSO w/ VP8LP. 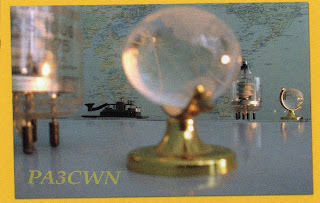 eQSL recebido: EA5IBW, Les Belones, Cartagena, Spain, 28 MHz, QSO w/ LU7YZ. eQSL recebido: PY1FOG, 28 MHz, Nova Iguaçu, RJ, Brasil, QSO w/ LU7YZ. 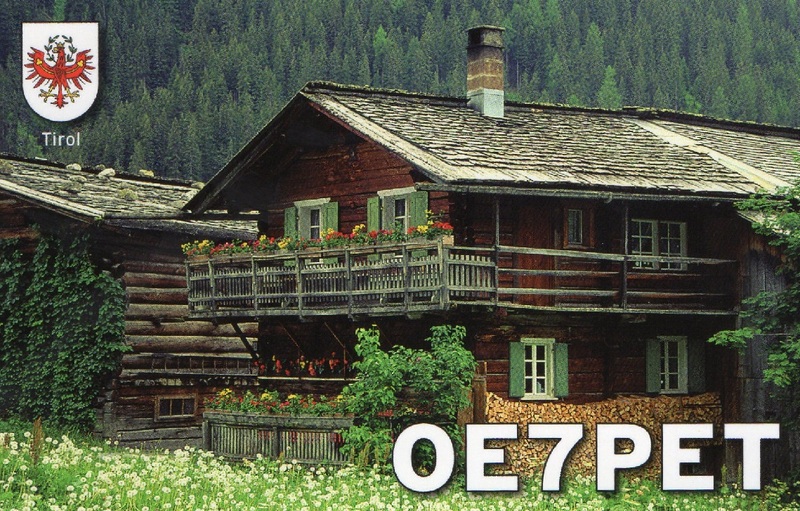 eQSL recebido: EB5EZA, Redovan, Spain, 28 MHz, QSO w/ LU7YZ.